Draize Test for Homo Sapiens! Cheesy Lunar Thrills from the 70s ! 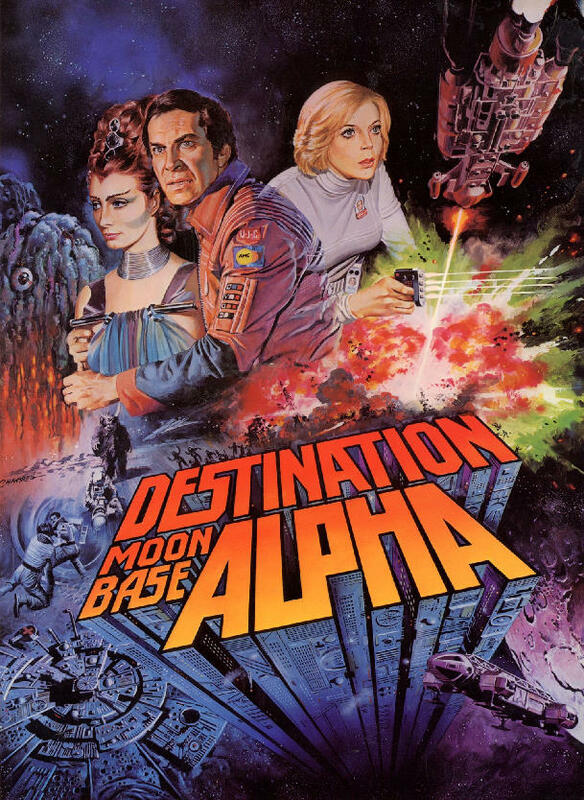 Destination Moonbase - Alpha was the pilot for Space: 1999 and a Gerry Anderson (Thunderbirds) production - perhaps the cheesiest sci-fi TV series that ever was. And I watched them all last week on a DVD induced trip to 70s-80s Sci-fi nostalgia. Anyway, we all know the premise, right? A celestial catastrophe knocks the moon out of orbit and Moonbase Alpha’s 311 crew are cast drifting in the "dark galaxy of the universe" for four or five seasons. The first episode already dangles a frustrated hope of salvage for the rundown moondwellers - a spacecraft called a "swift" filled with the crew’s friends, family and lovers visits the base, and the castaways are told that a contingent of rescue spacecraft is on the way to fly them back to Earth at speeds exceeding that of light. But everything is not as rose-colored as it seems. Commander Koenig (a miscast Martin Landau), having received a "brain scan" to get him back up and running after he went a little silly earlier, sees not friends and family but hideous latex monsters when he sets eyes on the visitors from the "swift." Try as he might to convince Helena (Barbara Bain) and the other Alpha crew members that the visitors are invading aliens and not saviors from Earth, he can’t get anyone to believe him. Finally he manages to talk his shapeshifter friend Maya into undergoing the "brain scan," which gets her seeing the monsters, too. She assumes the form of one and tries to infiltrate them - fruitlessly, it turns out, but she does learn that they are a species who feed on radiation. In the interest of rustling up some fare the aliens have fiddled with the Alpha crews’ minds to scam them into setting off a nuclear explosion. Commander Koenig quashes the aliens with a few well-selected fistfights and in the end the moon is free to zigzag through space unmolested. My view of the 70s has changed fundamentally since I revisited Space: 1999. Its forecast of the future are astoundingly clunky and primordial: the moonbase ís state-of-the-art medical wing looks like a silly Jiffy Lube, peppered with oscilloscopes and blinky, buttony science fair school projects, and the bases intercom is a black-and-white, closed-circuit video network much like the anti-shoplifting surveillance systems you still find in small liquor stores and pawnshops. They do have something that looks a bit like 3 1/4-inch floppy disks - which puts them above Rollerball (one cheesier classic of those days) in terms of accurateness, the latter film prognosticating reams of punch cards for the 21st century. Outside of this, though, Destination Moonbase - Alpha provides more hysterical than prophetic insight for the viewer in the late 90s or the current 2000s. The show’s closing point - that real life, no matter how mind-numbing, is preferable to fantasy, no matter how heavenly - is particularly old-world. In an era of creative revelation, it must have seemed natural to imagine that a future utopia would give supreme value to objective reality. Little did those TV writers of the 70s know that these out of date notions, far from enjoying a comeback, would be further damaged in the succeeding thirty years by social construction, deconstruction, and assorted other theories holding everyday reality to be just as fragile as the nice dreams the aliens offer the Alpha crew. But then again, it is easy enough for me to say this - retrospection, after all, is twenty-twenty. Besides, Destination Moonbase-Alpha’s opening Star Wars like homage actually sets the film in the year 2100 , so maybe there is still a little time for impartiality to come back into favor and vindicate Space: 1999’s currently out-of-vogue traditionalist loyalties. Gentlemen (and ladies): place your bets now!